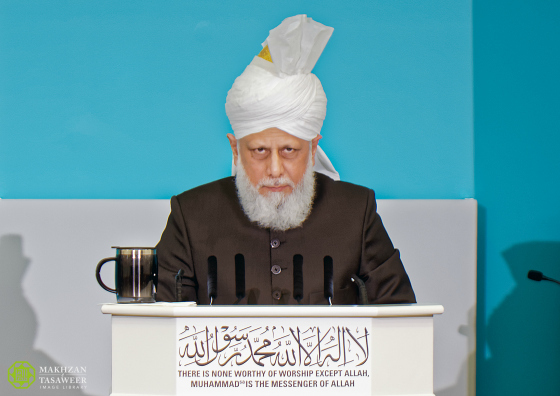 Head of Ahmadiyya Muslim Community delivers Friday Sermon in Peace Village, Canada. 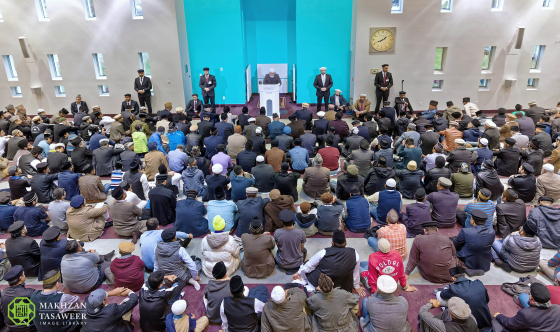 On 21 October 2016, the World Head of the Ahmadiyya Muslim Community, the Fifth Khalifa (Caliph), His Holiness, Hazrat Mirza Masroor Ahmad delivered his weekly Friday Sermon at the Baitul Islam Mosque in Peace Village, Ontario, Canada. 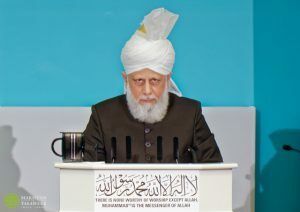 During his sermon, His Holiness reflected upon the lives of two eminent personalities of the Ahmadiyya Muslim Community. Both Imam Bashir Rafiq Khan and Dr Nusrat Jahan passed away in England on 11 October 2016 after having spent their lives serving the cause of faith and humanity. Amongst other notable aspects of his life, Imam Bashir Rafiq Khan had served for a number of years as an Imam of the Fazl Mosque, the first Mosque built in London. He strived to spread the true peaceful teachings of Islam through various means and also initiated the English magazine,‘The Muslim Herald’. His Holiness mentioned that Imam Bashir Rafiq Khan served the cause of faith diligently and placed great trust in prayers and always advised his children to remain loyal to Khilafat. Mentioning the life and services of Dr Nusrat Jahan, His Holiness said that she was a renowned gynaecologist in Pakistan, who had trained in England. She dedicated her life for the service of faith and humanity and served in the Fazl-e-Umar Hospital in Rabwah, Pakistan. His Holiness said she selflessly served with great compassion for her patients and the large number of people she treated will be ever indebted to her. His Holiness mentioned that she studied and worked for some time in the UK and never compromised her Islamic practice of adorning the veil. His Holiness mentioned the narrations of a number of people who had been affected by her pious and kind character. Following the conclusion of the Friday Sermon, His Holiness led an emotional Bai’at ceremony in which several people took the pledge of allegiance at the hand of the Khalifa for the very first time. Share the post "Head of Ahmadiyya Muslim Community delivers Friday Sermon in Peace Village, Canada."